After kondominium, what's next? 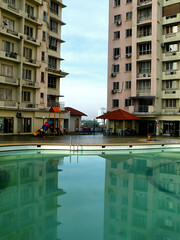 We will leave the 19th storey unit in KL suburb and visit the heart of Kuala Lumpur city, where I booked a room for two nights in January 2009. 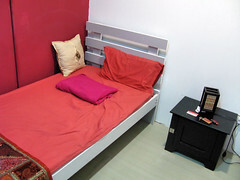 The guesthouse, at Jalan Mesui, is within walking distance to Bukit Bintang, the main shopping belt of KL. The January trip was a shopping extravaganza of sort. 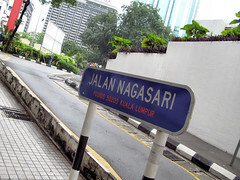 As you can see, Jalan Nagasari is sloping. So Jalan Mesui is somewhere at the "valley" bottom. I have to trudge up this unavoidable slope to Raja Chulan Monorail everyday. This is definitely a steeper incline than the one at Gurney Height. 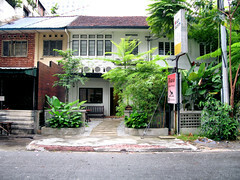 While Gurney Height rests on a "bukit", this guesthouse lies on lowland. This is my guesthouse. Yes, the middle one .... without a gate! According to the caretaker, the guesthouse is safe due to the presence of security (or carpark 'jaga') at the opposite building and the crowd in the pub next door. You can see them here. The caretaker can vouch for safety inside the guesthouse, but that didn't allay my fear walking back from Bukit Bintang one night. The street is pretty desolated and crowds stay indoor (guesthouse, sarabat? stalls, pubs etc. ), not out. I made a few turns and thought I was lost. I panicked seeing the occasional man 'following' me. Finally, my single room for RM 55. Unlike my room at Gurney Height, this one has air-con, but no window or wardrobe. There is an extra cushion too. Rate is inclusive of breakfast and towels. Exclude them and you pay only RM 50. The townhouse has 13 air-conditioned rooms and 5 bathrooms with hot water shower. The 'highlight' (for me) got to be the bathroom "open to the sky". It is true. They have this bathroom "where guests can see the beautiful sky in the city centre". To quote the website, this is "an experience not to be missed". Haha. My zest for historical and urban adventure finally took me beyond the shores of Singapore. Unlike typical backpackers, I travelled alone because my decidedly weird interest and orientation (yg commented I'm young but think old) made it hard to find a partner in crime. So from January 2009, I have designed, planned and executed a couple of 'missions' to Malaysia (Malaysia because you go regional first before you go international right?). These were shoestring missions because Second Shot's modus operandi for missions is - cheap transport, cheap room, cheap food. No money, no honey. No Hyatts or Hiltons. This August, I gave NDP a miss and was in Kuala Lumpur (KL) during the long weekend. I was spared missed the pledge at 8:22pm and the chance to showcase my solidarity and unity with other Singaporeans. How unfortunate fortunate because I was enjoying my dinner and the free wireless with my paperweight in a quiet cafe at one of KL's largest shopping malls. In fact, I was having an email conversation with Peter when the pledge was read. Records show I replied his email at 8:24pm. Absolutely mesmerizing. KL city skyline glowing in the distance and nice suburb houses littered along a brightly lit but unbusy road. 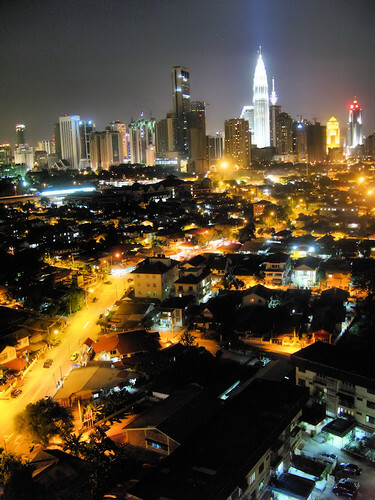 Away from congestion and pollution, the din and fast-moving lifestyle of city dwellers, I began to savour KL the city from my open window in the suburb. Alone in the room and lost in thoughts, I didn't even notice the soft country breeze blowing gently. For that fleeting moment, I wished I had a Chardonnay. That moment in the room was indeed fleeting. The caretaker came back shortly after. Huh .... an intruder in my room?! No lah, he was really the caretaker and I was actually in the living room of the condominium unit. I arrived at around 10:40pm on my first night in KL. While he was off retrieving my room keys, I took a shot of the KL city skyline. You won't see the aircon because there was none. You won't see the fan because even though it was there, I think it is 'unglam' to include it - a standing fan - in the composition. Welcome to Gurney Heights Kondominium! Excellent! 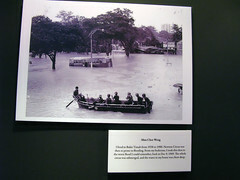 This can rival even yg's famous photo of Kallang River Walk that was much admired by Chun See. Next comes the facilities. No, I don't think I skipped the sauna and I can't imagine how the gym will look like if there is one. 1. Colorful playground in a 'drabby' condominium. 2. Business Center. Opens daily from 12pm to 12am. Internet at RM3 for 30 minutes. 3. Interior of Business Center. 4. Swimming pool from a vantage point - some landscape rocks if I remember correctly. 5. 24 hours Indian 'restoran' and mini-mart beside. These facilities are located on the 5th floor. My unit is on the 19th floor. No babes were swimming or sun-tanning. Anyway the pool is not visible from my unit which, luckily, faces the KL skyline. Some units indeed face the pool - how depressing. I will blog about this Indian restaurant in future. Shiok, so you hear only positive comments. 1. Lift lobby. Taken at 5th floor, where there is access to the open area with the facilities. This explains the reflected sunlight on the lift door. My most vivid memory of the 19th floor lift lobby - it was almost pitch dark one night when I got back. 3 and 4. Guardhouse at main gate. The world outside holds more attraction so how conveniently located is the condo to the nearest public transport? For starters, the condo encourages pre-travelling workout because the main gate is located on top of a slope. So every morning, I do my warm-up by going 'up the hill' and when I get back at night, I do my cool-down by going 'down the slope'. It helps that the air is cooling at night. 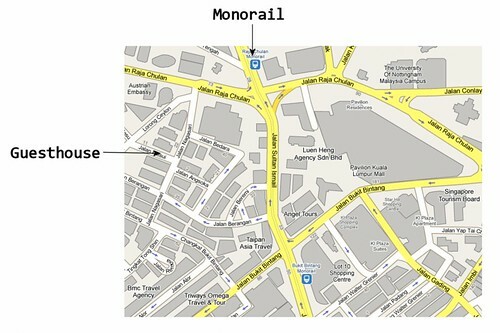 There are two LRT Stations in the vicinity of Gurney Heights. The guesthouse website recommends Damai (bottom left). I don't recommend it. 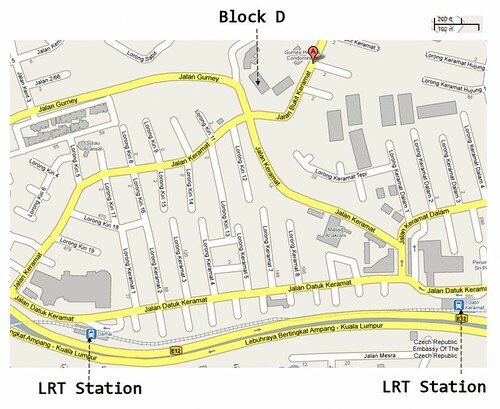 From the map, don't you think Dato Keramat Station (bottom right) is nearer to Gurney Heights? On my arrival night, I tried their recommendation and didn't like it. On exit at Damai, you actually walk back along Jalan Datuk Keramat then forward along Jalan Keramat. 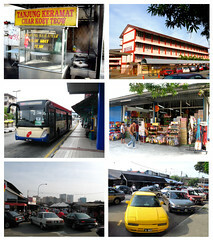 I don't like the idea of regressing, furthermore that stretch of Jalan Keramat has too many side roads. You don't see a single side road along Jalan Keramat to Dato Keramat Station. 1. Char Koey Teow stall. I think their version of our Char Kway Teow? 2. 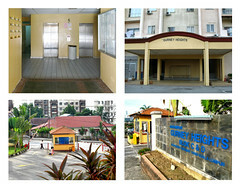 The school near Dato Keramat Station. Together with the mosque, prominent landmarks at the fork junction and navigational sight posts to Gurney Heights. One night, I keh-kiang and chose the right (read: wrong) fork to Jalan Keramat Dalam. 3. Provision shop in a zinc-roofed building. 4. Near Dato Keramat Station. LRT viaduct in the background. A pasar across the road. 5. I think their neighborhood pasar at Dato Keramat. 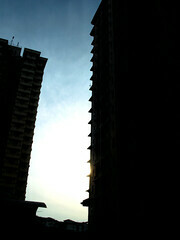 Condominiums in the background. 6. Bus terminal below Dato Keramat Station with RapidKL T307. Also I rate my 'guesthouse' pretty decent in terms of cleanliness and facilities. The owner has two units on different floors and I got the one above the caretaker. The living room, with an attached balcony, is air-conditioned with TV and sofa. There is a dining table for communal meals and a fridge in the kitchen. The spacious bathroom has a powerful shower and dummy-proof water heater. Down at the caretaker's unit, there is also free internet access - you can use their desktop or just ask for the wireless password. For RM45, I got them all. 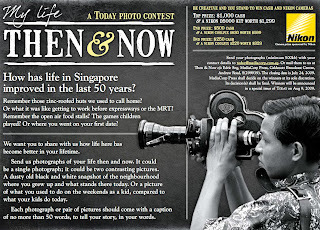 I visited Orchard Central on Saturday to check out this new shopping mall as well as the "My Life: Then & Now" photo exhibition organized by TODAY newspaper. The 50 best entries were showcased, out of over 900. I must say the grand winner is really creative in his choice of presentation. I read in the news he is a designer. He is Kendrick Wong and goes by the nick redmonsoon in cyberspace. You can read his flickr here and how he composed the winning shot here. Congratulations Kendrick! Here is one I find cute. From two pretty ladies, we now have two old fogies. I guess they are now attractive in other ways - like their storytelling abilities and culinary skills. These and other entries are available for public viewing in the Today gallery. But the gallery, broken up into 24 pages, takes a while to load even the thumbnails because the photos are preloaded as well. 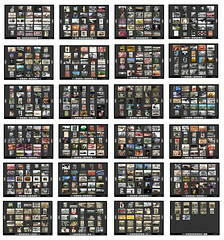 I've compiled all 24 pages into 1 mosaic so it is now easier to view all the thumbnails. Find a photo you like from the mosaic and go straight to the gallery page to download. I realize Mediacorp uses Silverlight for the gallery. Silverlight is a technology similar to Flash but because it is still not as pervasive as Flash, your browser may not have it and it will prompt you for installation. 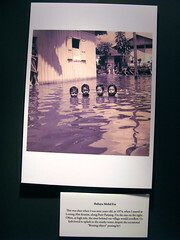 The exhibition will run from Aug 9-21 at level one, Orchard Central. If you are interested, do note it is just inside the entrance from Killiney Road. Do not be like me - entered Orchard Central from Orchard Road entrance, searched high and low from 1st to 8th floor, then realized it is at the Killiney Road side entrance of 1st floor. 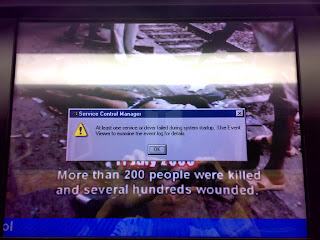 As mentioned here, I take the MRT on an every day basis. It became my main mode of transport after I entered university. Before that, my lifestyle revolved around places in the east - my primary and secondary schools, my junior college, my military camp, even my old flat before we shifted to even further east. Life changed after I got matriculated - my university, now my workplace, even my reservist camp, are all in the west. I was not spared during my university internship and courtship even. 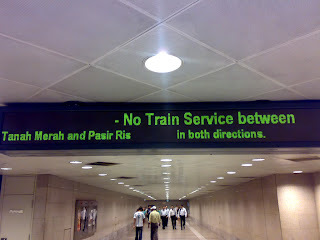 To reach those places, the MRT was my choice, often my only choice. 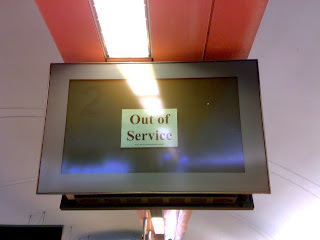 As a loyal train passenger (8 years and counting), I have the honour to present some of the error and gotcha moments encountered during my commuting. If you are expecting gotcha moments that will set your hormones raging, you'd be disappointed because none of my fellow passengers' modesty was insulted in the course of recording. Neither will you find the accidental suicide photo because they belong to the Chinese tabloid papers; this blog does not encourage posting of traumatic pictures. As a professional in the IT industry, I have an active interest in software systems. 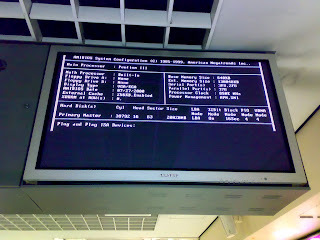 In fact, I'm constantly on the lookout for software error/gotcha moments in public. These sometimes 'malu' moments gave me a chance to peek into their system. 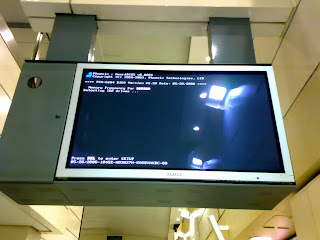 Now I know that under the surface, their software is not much different from mine - buggy, cryptic and with the occasional crash. So sorry that your hormones will not be raging, but do enjoy the pictures. My paperweight arrived on Saturday morning via their courier. I had ordered it online on Thursday night. By Friday it was ready. I'm pleased with their customer service. 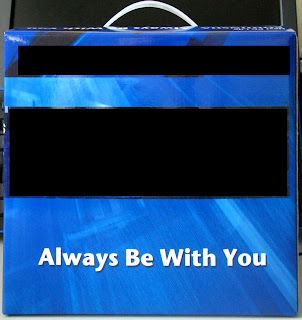 Nice tagline - Always Be With You. I have always wanted a companion [on the move]. Now my wish is fulfilled. The product is Japanese. Woo .... nihon stuff, ichiban. The box for accessories. 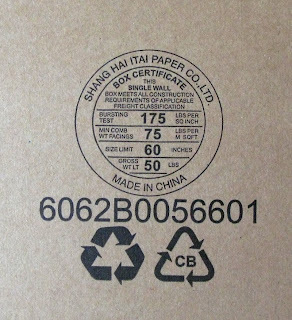 Too many things are made in China now, including this paper box and my Japanese product. Finally my paperweight. Not the Queenstown book, but inside the cover on the left. 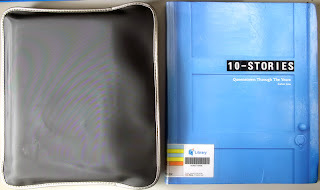 As you can see, when taken out the paperweight is smaller than the Queenstown book. By the way, this is not a quiz. However you are welcome to place your guess. I bought the paperweight to be more productive on the move. The bulk of my commuting is on the MRT. Unlike a cab or bus, our MRT has sitting passengers facing each another, an awkward situation in some case. Just that day, I shifted to another seat in order not to be distracted by a lady opposite. 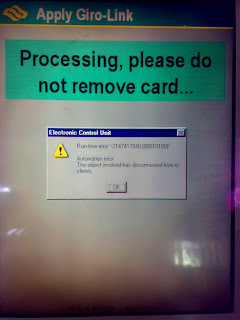 I leave you to guess the reason. Yeah I know such distraction is no reason for a paperweight. It is just that the MRT provides a conducive environment for certain activities .... like reading a book. I have plans to use it for my heritage research too. The paperweight will be a good companion outdoor, during my heritage field exercise.